I was very excited about this colorful comforter and it didn’t disappoint! It’s just what I was looking for, true to colors, soft to to touch. It fitted perfectly in my bedroom! Give your bedroom a quick make over with this three or four-piece comforter set. This set includes two decorative pillows, a comforter, and one or two pillow cases depending on the size ordered. 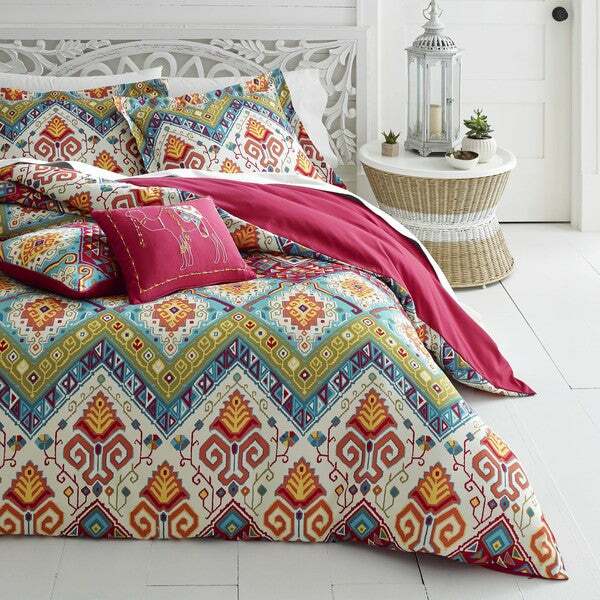 This comforter set showcases a globally-inspired pattern in shades of pink, green, orange, blue, yellow, and cream. This machine washable comforter set is sure to add some globally-inspired vibes to your bedroom decor. Vibrant colors, comforter is Light weight. Washes for first time and it fell apart. Stuffing is now lumpy and the material bled and faded. Would not recommend. Before I bought this, I had been using a down comforter and duvet cover for years. I thought that nothing could be better when it came to the soft quality or comfortable feel. I was wrong! I was worried that this would feel scratchy, as most comforters do. However, I was so pleasantly surprised when I received this. It is so incredibly soft! It just makes you want to curl up and sleep. It is amazing. The colors are a bit deeper than they appear in the photo. The photo makes this look more fuschia and it is redder. I wish it was more fuschia but it still works in the room. I am very happy with this purchase. Beautiful bright brilliant colors. Negatives, it's very light weight wouldn't recommend it for the winter. The comforter set is very colorful with beautiful vibrant colors and cute pillows. It was a little more light weight than I thought it was going to be, not really a good cold winter comforter. The fabric is soft, not scratchy at all, but I thought it woud be a bit warmer. Guess I will appreciate that fact during other seasons. My item/package arrived damaged. It looked like the colors were great. The item looked a little thin for a comforter, but the accent pillows looked nice. Wish it would have been better quality. This is a beautiful set. After 2 years of use I have noticed that the stuffing has shifted and the comforter is now quite lumpy. I love the design though, so I may try to find a duvet with the same print. Very nice. The wife is happy so I am happy. Fits the bed nicely and has very vibrant colors. Very very soft. Gorgeous bright colors and not too heavy. Really bright! we absolutely love the colors it brings to our bedroom. We are using it for our summer quilt! "Can I order 2 extra pillow shams to use to make curtains"
At this time we do not offer the pillow shams for purchase individually.